Even with summer in full swing, the Selectmen and Town officials have been busy attending to the work of Bow. Some highlights include closing the Town’s books as of June 31, 2018, and again coming in on budget, even with settling a major tax case. The Town Manager David Stack and our Finance Director Geoff Ruggles deserve credit for meeting our budget goals, and for keeping impeccable records. Thanks to the efforts of our Community Development Department, the hard work of the Planning Board and our Code Officer, Coastal Forest Products broke ground on their new facility on River Road. It will be even larger than the Exel warehouse on 3-A, and we look forward to a long relationship with our newest corporate citizen. As the Town Manager reports, one of our long term and highly valued member of the Bow Fire Department, Captain James Beaudoin resigned to accept the position of Fire Chief in another community and Firefighter David Eastman resigned to accept a Fire Inspector position for the Town of Derry. This is another example of our department being recognized for the excellence of our personnel, which is also evident in the quality of individuals who applied to join the BFD when there was an opening. We are pleased to have Greg Aucoin and John Bowler join our department and look forward to having them with us for many years. With the completion of the Public Safety Building, space in the former Police Station was re-purposed to provide a home for the extensive collection of historic artifacts collected by the Bow Heritage Commission. In addition, thanks to the close working relationship of the Town and the School District, our bus drivers finally have a proper office space and a meeting room in the building. With the busses parked at the building, and our maintenance facility on site, this was a much needed and long overdue improvement. Another boy from Bow became a Boy Scout Eagle Scout by completing a service project in Town. Brian Chagnon designed, constructed and installed a number of purple martins houses at the Hanson Fields and at the Safety Building to enhance the opportunity for our citizens to enjoy these beautiful birds. Troop 75 continues to provide service to the Town, and to help our boys mature into reliable young men, which is another reminder of how fortunate we are to live in Bow. Chief Lougee has again qualified Bow to receive a Crime Line Grant to provide even better services to the Town. Every citizen should be pleased to know that Bow is ranked as one of the safest towns in New Hampshire, with New Hampshire ranked as the safest state in the nation. This distinction would not exist but for the dedication and hard work of the members of our Police Department, so please take the opportunity to thank them for performing a dangerous job on our behalf. 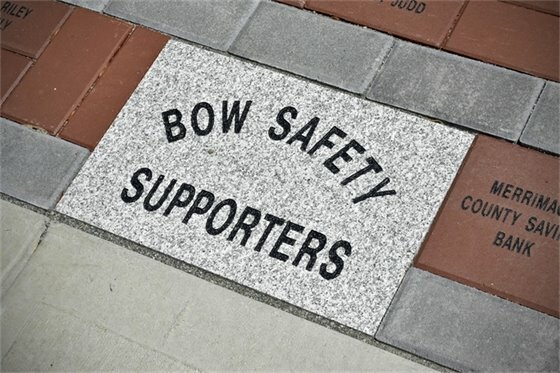 And while thinking of the Bow Fire Department and the Bow Police, please note that the second round of engraved bricks are now available to purchase for future installation at the Public Safety Building. Information and order form are available at the end of this Bulletin and on the Town’s website. In addition to being an opportunity to express your views, or honor a loved one, the proceeds will be used for landscaping and other needs at the building. With sadness the Selectmen note the passing of Chum Cleverly. Chum was an outstanding Road Agent and Director of Public Works, and took the Department of Public Works to the high level of professionalism we know today. Chum also created the mutual aid program among surrounding towns and Concord. Whereby we share resources when a community's needs are stressed. This saved Bow considerable money over the years, and also epitomized Chum's commitment to service and a keen eye for saving money. He will be missed by many. David Stack, Town Manager Photo © Eric Anderson. The New Hampshire Department of Transportation has put together a team of DOT staff and Town representatives to conduct a road safety audit (RSA) at the I-89 southbound exit 1 off ramp. An RSA is a formal evaluation of a particular location and the goal is to enhance safety for all road users, under all weather conditions. The Town's representatives include the Town Manager, Police Chief Margaret Lougee, Fire Chief Mitch Harrington, DPW Director Tim Sweeney, Selectman Matt Poulin, and Emergency Management Director Lee Kimball. The team's first meeting was held on September 5. We reviewed existing data on conditions, traffic speed, traffic volume and crash history. The team also conducted a field visit to observe existing conditions, including geometric attributes and condition of roadway, traffic movements, signs pavement markings, the needs of users and the effect of weather and vegetation on visibility. With reconstruction planned in the foreseeable future, we’ll be focusing on appropriate lower cost measures that could be implemented quickly. The DOT will be preparing a draft summary report for review by the team. The report will be finalized and the DOT will select recommended action(s) for improvements. In 1909, the Boston Post newspaper sent gold headed canes to award to each communities oldest resident. The tradition is being carried on today, as the Board of Selectmen searches for the oldest resident in Town. Nominations will be accepted through December 1, 2018. To qualify, the nominee must be the oldest in Town, based on the information provided. There is no minimum age requirement; however, the recipient must be a domiciled in Bow for at least the previous 12 consecutive years. Nominate a neighbor, loved one, or even yourself! The Selectmen look forward to bestowing an honorary cane and recognition to our oldest resident. Nomination forms are available at the Municipal Building, Library and Recreation Department, as well as, here. Or, you can call (603) 223-3910 to request a form by mail. Town resident Tom Modini started as a call firefighter in August. He is a registered nurse in the process of credentialing as an EMT. He enrolled at the NH Fire Academy this month to begin his basic firefighter training. Welcome Tom! Greg Aucoin began the last week of August to the vacancy created when Captain Beaudoin resigned. He was a Firefighter/Paramedic in Laconia. He is also a call Firefighter/Paramedic in Henniker where he resides. We were very fortunate to hire Greg as there is a statewide shortage in quality candidates. Welcome Greg! Bow Police and Fire implemented the final phase of the "Warm Zone EMS" grant. We received nearly $10,000 in grant funding to purchase equipment, training, and payroll reimbursement. Warm Zone EMS is the use of special equipment and tactics where EMS works in concert with law enforcement providing immediate patient care during mass shootings. On August 8, 2018, Bow Police and Fire, as well as, neighboring departments participated in practical training at the Bow High School. Newly promoted Captain Brandon Skoglund starts NH Fire Academy Fire Officer I course in September. This is a 56 hour class which focuses on first level supervisor knowledge and skill. Chief Harrington assisted the Town of Allenstown with their selection of their new Fire Chief. Scarecrows Have Come to Bow! to Fall into a Festive Autumn Spirit! Come to the Bow Parks & Recreation Office beginning the week of September 17, 2018, to purchase a scarecrow head for $5.00. You can choose to paint your own face or we will have some already painted. Take this home and create your own Scarecrow to display at your home. Let’s have some fun Bow spirit and decorate the town! How fun to check out all the Scarecrows in Bow. Bow Parks and Recreation's Annual Halloween Party will be Friday, October 26, 2018 beginning at 4:30 PM at Bow High School! Watch for more information as it BOO-comes available. 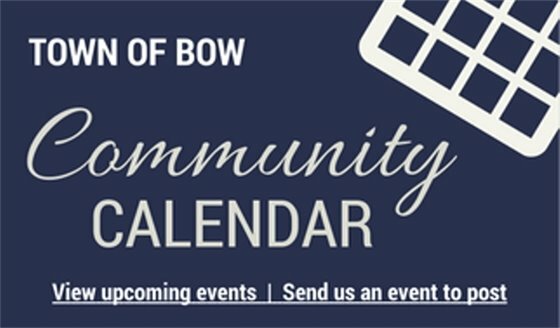 Check out our Facebook Page ”Bow Parks & Recreation” This page is updated regularly to keep you informed of “Parks & Recreation Happenings” here in Bow. Master Patrol Officer Matt Pratte and School Resource Officer Mike Carpenter responded to a welfare check and found a a person barely alert and bleeding profusely. Officer Carpenter’s swift and courageous actions in applying a tourniquet off his duty belt, (which the department had just purchased) administering quick clot from MPO Pratte, and calling for a Medic, undoubtedly saved this person’s life. These two brave Officers will be honored at the next Department training. Chief Margaret Lougee and SRO Mike Carpenter trained on Active Attack Integrated Response (AAIR). Sponsored by the Advanced Law Enforcement Rapid Response Training (ALERRT) and Allenstown Police obtained a grant to host it. This focused on Law Enforcement response on stopping active shooter incidents, providing security, Incident Command, immediate medical aide and assisting EMS/Fire with the Response Task Force (RTF) to provide life saving measures. Six members of the Police Department attended a day long training with the Bow Fire Department on Response Task Force Warm Zone functions, sponsored by the State of NH Division of Fire Standards and Training & Emergency Medical Services on a grant funded program. This allows for an expedited medical treatment during a crisis situation. This was a great integration of our departments to train and function as one. Thank you to the School District for allowing us to use Bow High School for this important training. Congratulations to Officer Phil Goodacre and Officer Mike Carpenter on their acceptance to the Central New Hampshire Special Operations Unit (CNHSOU) Negotiator Team. They will soon be attending a Basic Negotiator Course in Waterville Valley, ME. If you own a business in town and would like to have your Safety Manual and Safety Procedures reviewed by the Police you are encouraged to contact Chief Lougee at 223-3950. This is a community service we provide to anyone wishing our consultation and training opportunities. Police/Fire Softball game to support Special Olympics will be held September 21, 2018 starting at 6 PM on the softball field behind the Bow Memorial School. Anyone wanting to play please contact SRO Mike Carpenter or just come and show your support. #Law Enforcement Lip Sync Challenge Bow Police has been challenged by the Hooksett Police Department and Bow Fire Department has agreed to lip sync with us!!! Anyone with coordination ability to be able to pull this off ? Please contact Detective Blanchette (223-3950) if you wish to participate and or coordinate this highly publicized event. We will attempt to incorporate the Town of Bow into this production. 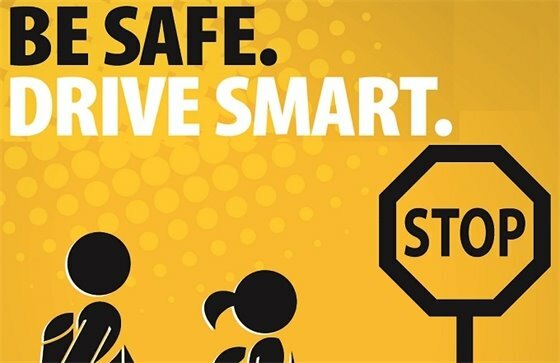 School Zone Speed Limits are in effect 45 minutes prior to school and 45 minutes after school. There are monitor flashing yellow lights on the side of the road with the speed sign attached. Bow Center and White Rock Hill Road become 10 mph slower during these time frames. Those areas are highly patrolled for safety. 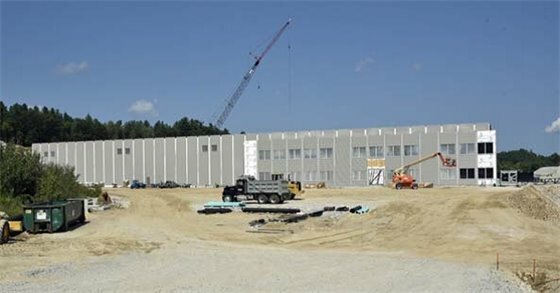 Bow Mini Storage has started construction with plans to build two additional storage buildings at their Bow location on Tallwood Drive. The crew installed 60 feet of solid drainage culvert on Van Ger Drive and replaced a deteriorated 4' diameter culvert pipe on River Road, near the boat ramp. New curbing was installed next to the accessibility ramp at the Old Town Hall. The Recreation Division continues to maintain the parks and fields, and have started lining the fields for the upcoming soccer season. Bids were advertised for a new second irrigation well at Hanson Memorial Recreation Area. On September 6, 2018, movers will move the hobnail safe and three fireproof file cabinets from our former basement room in the Municipal Building. This will complete our move to the Robinson Road location and leaving the room available for storage use by other town organizations. Edward G. Cheney c.1900 Wagon Wheel Jig Stone Sign. An informational sign has been installed at our Robinson Road site. Come view this rare stone and its history. The Heritage Room will be open to the public on Saturday September 15, 2018 from 10:00 AM to 2:00 PM and by appointment (Gary Nylen 603-496-5239 or by email at gary42bow@comcast.net or Faye Johnson 603-228-8149 or by email at fjohnson915@ myfairpoint.net. This years Heritage Day will take place on September 29, 2018, 11:00 AM to 2:30 PM at the Bow Bog Meeting House, 111 Bow Bog Rd. Come listen to the Chorale Singers, hear the reed organ played, learn about the 1832 Baptist Church, watch the blacksmith at his forge, see Bill Emerson’s bowls, and perhaps split some granite. Heritage note cards, sun catchers and history books will be on sale and Christmas/Holiday cards can be ordered. Bow Men’s Club will be selling a ham and bean lunch, beverages included. A free homemade pie social will be followed by the Memorial Bell Ringing Service. Contact at fjohnson915@myfairpoint.net or 603-228-8149, if you would like to demonstrate or sell your crafts. Spaces are free, but limited. The Bow Public Safety Supporters are once again having a brick fundraiser for continued landscaping at the Bow Safety Center. You can have your name or business engraved on a brick that will be permanently displayed at the front of the building. What a great way to leave a lasting impression. Bricks are available in two sizes, 4” X 8” for $ 75.00 and 8” X 8” for $ 125.00. The bricks, engraved with your message, will be installed in Spring of 2019 (weather permitting). If you have any questions, please email Tonia Lindquist or you can call her at 223-3910. Please place your order by December 31, 2018. Click here for an order form. To view more photos of what the bricks look like and the landscaping that has been done, please go to the Town of Bow's website and it is right on the homepage. Congratulations to all who took part in our summer reading program! We had a total of 404 participants, who read 4,849 books. The total number of K-6 grade kids who participated was 212, and almost half of them met their reading goal which is phenomenal! We’d like to extend special thanks to the providers of our halfway-to-your-goal prizes, Orange Leaf (owned by Kristina Hathaway), and our met-your-reading-goal prizes, Constantly Pizza (owned by Dave & John Constant). The total value of all donated prizes exceeded $1000.00 We truly appreciate local business support of literacy and education in our community! Our FREE monthly community yoga classes will begin again on Saturday September 8, 2018 from 9 AM to 10 AM in the Library's Lower Level. Please register in advance by emailing lori@bakerfreelib.org, or calling 224-7113. If this is your first time attending our community classes, please arrive by 8:45 AM so that you have time to fill out the liability waiver and get set up. Namaste! The Baker Free Library is seeking an Evening Circulation Desk Assistant. This would be for Mondays and Tuesdays from 4:00 PM to 8:00 PM year round. The successful candidate must enjoy interacting with the public, be detailed-oriented, and have a technology skillset. Professional demeanor and excellent communication skills are also required. Bow High School students 14 years old and above are encouraged to apply. These hours are non-negotiable. Please do not apply to this job if you know you have conflicts at any time during the year with these hours. The Application deadline is Friday September 14, 2018 at 7 PM. Anticipated start date is late September. For more information and an application, visit www.bowbakerfreelibrary.org. The Baker Free Library is an Equal Opportunity Employer. Join Maureen Miller, Retirement Coach, to talk about the next chapter in your life! Retirement is not solely about financial planning it’s also about your readiness physically, mentally, and emotionally. Learn about how the evolution of retirement may impact your life, and explore retirement perception versus reality. Registration required, email lori@bakerfreelib.org. Bring your whole crew, along with sheets, blankets, beach towels, and more to build your own fort (some materials provided) and then listen to a story while eating s’mores. This is a drop in event. Beat the Librarians Trivia Night at Litherman’s Limited (Hall Street, Concord) Thursday September 27, 2018 at 7:00 PM Librarians from Baker Free Library and Concord Public Library will compete in a trivia night against teams of six come just to watch or form a team of six to play! Many donations have come in over the summer, so the Friends are holding a $5.00 per bag book sale for the month of September. Stock up for winter reading, there are a ton of great reads to choose from. $5.00 per plastic grocery bag of books, please try to bring your own bags. The library will have some grocery bags available at the start of the sale, but will probably run out fast. Please make sure to bag your items in the plastic grocery bags before placing them in boxes or other types of bags so that the library's desk staff can finalize your purchase quickly and efficiently. Questions? Email info@bakerfreelib.org. Looking for the perfect way to say Thank you? The Heritage Commission has various stationary note cards for purchase at the Town Manager's Office. These note cards are designed with photos of Bow taken by Eric Anderson. The cards sell for $3.00 each or $16.00 for a set of six cards. 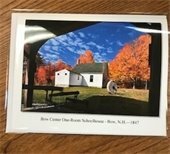 Feel free to stop by the Town Manager's office to see these cards and other merchandise for sale by the Heritage Commission. Coming Soon Christmas Cards of Bow. These Christmas cards will feature winter scenes of Christmas in Bow.